I didn't think I'd be the kind of guy with a tagline or a catchphrase. But today, I am. If you don't know the words yet, you will soon. They're the guiding philosophy behind how I invest. I've used these three simple words to define three investment rules. These are the three things I always look for when investing. And they've shaped my career. Today, I'll share my guiding philosophy – and one investment it points to right now. Before I put money to work, I want to find an investment that is cheap, hated, and in the start of an uptrend. This strategy is contrarian by design. It means buying after investors have given up... when prices have fallen to attractive levels. It also means having the discipline to wait for prices to reverse. That simple model has been the key to my success. And it's been responsible for the biggest gains of my career. That includes the calls I've made in the gold market, which have been some of the most profitable recommendations for my readers over the years. Interestingly, these three principles point to gold as a fantastic opportunity right now. You see, gold has spent the better part of seven years falling in price. It's down by more than a third over that period. So clearly, the metal is cheap. Investors also hate the idea of owning gold. And it's easy to see why. The precious metal has been in free fall most of 2018, losing roughly 11% of its value since its January peak. And this year's performance is a continuation of the longer-term trend. Gold is disaster insurance. It goes up when the global economy goes south. And we haven't had a disaster in more than a decade. The result is that investors have moved on to greener pastures... They've given up on gold. The metal recently hit its most hated level in 17 years, as I explained in a recent DailyWealth essay. Gold has slowly been trending higher since August. The metal is up a little more than 3% since then. And prices appear to be hitting what analysts describe as "higher lows." This might not seem like a major rally. But it's exactly the setup we want to see. Said another way, gold is cheap and hated... And it's finally starting an uptrend. I've built my career looking for these kinds of opportunities. It's how I've found my biggest winners. And right now, gold fits this investment philosophy perfectly. You can get in on this opportunity today by buying shares of the SPDR Gold Shares Fund (GLD). This fund holds physical gold to back its shares... And it's the easiest way to take a position in gold. P.S. I've made the best calls of my career using this strategy... including the biggest winner in Stansberry Research history, which we closed for a massive 995% gain. But now, I believe one stock could ultimately take over the No. 1 spot. It has nothing to do with gold. Instead, it's part of the biggest prediction I'm making about the markets right now... Learn the details here. "When an asset falls further than people expect – for longer than people think is possible – they give up on it," Steve says. 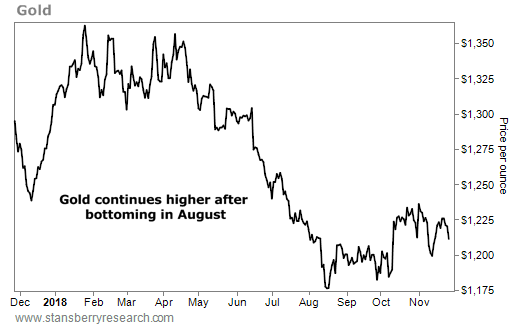 Get the details on another commodity that could be poised to soar here: Extreme Pessimism in Precious Metals Points to Triple-Digit Upside. "Most commodities have taken a beating in recent months," Brett Eversole writes. "But one in particular is setting up for potentially massive gains right now." Learn more about a surprising asset in the start of an uptrend right here. This is good news for businesses like Monro (MNRO). The auto-service and tire provider runs more than 1,150 stores across the U.S… while offering lower prices than the major dealers. Monro also owns several well-known auto centers and tire brands, like Mr. Tire and Car-X. 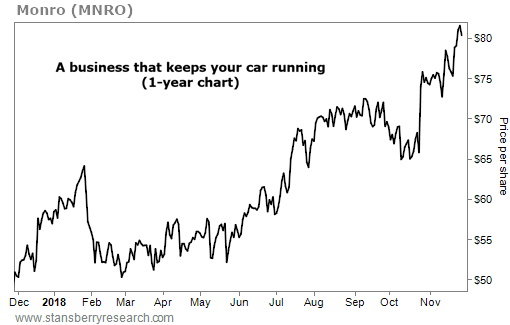 Tuning up cars keeps Monro in constant demand. The company reported a 10.5% jump in sales for the second quarter – hitting a record $307 million – along with a 25% increase in earnings per share.